Okay, don't scoff, all you 'Grammers with billions of followers! Hitting the 100 mark is very exciting for me and as a token of my appreciation, I'm holding an appropriately little giveaway for this small milestone! I'm sharing a little of the Australis love and giving away a Velourlips Matte Lip Cream, you know, like I've been raving about here and here. And here. Accounts must be public to enter. The competition will run from 5pm Australian Central Daylight Savings Time on Tuesday 24 March, 2015 to 5pm ACDST on Friday 27 March 2015. Winner will be the best answer chosen from the compliant entries. Game of skill. 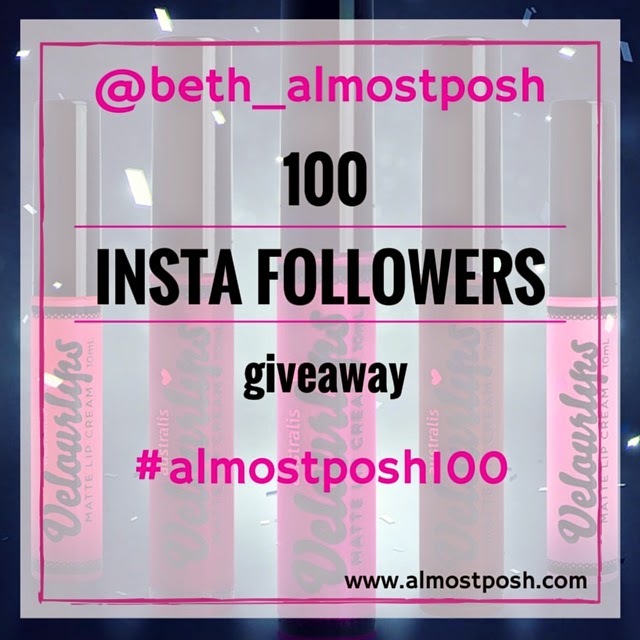 This giveaway is not sponsored by or affiliated with Australis Cosmetics or Instagram.